"They are far superior to us [in metal working], and furthermore there is no church [in the Basel region] so small that it does not have a magnificent clock and sundial." Not that the unwary could always rely on them: "The clock [in Basel] always sounds one hour later than it really is. If it sounds ten, it is really only nine; they explain that this is because such an error in their clock once preserved their city from an attack." Man's pocket watch made by Roches and Eynouf, Geneva, c 1740-50. 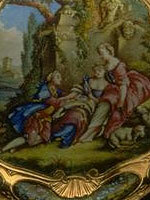 The enamelled case shows a landscape with ruins. The watch itself is made of gold, with silver hands. Travelling clock made by Abraham-Louis Breguet in 1796 and sold to Napoleon. It shows the month, date and day of the week and the phases of the moon. Pair of clocks attributed to Genevan clockmakers in the workshop of James Cox of London, 1780-1810. They represent the sacred mountain of taoism. At the hour, or when desired, the elephant waggles its ears, tail and trunk, the figures revolve, and a carillon of nine bells sounds. 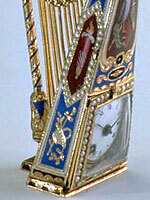 Watch pendant in the shape of a harp. Geneva, 1805. Decoration enamel on gold. Although Switzerland is nowadays so closely associated with watches, it was not always so. A slow beginning was followed by a gradual rise to dominance, succeeded by what threatened to be a catastrophic decline, before a dramatic turnaround at the end of the 20th century. 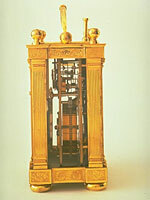 The pioneer nations in clock and watch development were Italy, Germany, France, England and the Netherlands, where clocks were in demand either as luxury items for wealthy monarchs and aristocrats, or as precision instruments for scientific purposes, first and foremost for determining longtitude at sea. The Swiss had no aristocracy and were indeed known – and in some places mocked – for their austerity; nor did they have ships exploring unknown oceans. There was a flourishing industry in Geneva by the beginning of the 17th century which continued to prosper, in part thanks to the austere rule of Jean Calvin, who had banned ostentatious shows of wealth, forcing jewelers to turn their skills to watchmaking instead. Geneva remained the centre for design and marketing both before and after it joined the Swiss Confederation in 1815. But manufacturing spread to other areas as well, in particular to Canton Neuchâtel. Swiss craftsmen also travelled abroad to study and to exercise their skills. Undoubtedly the best known is Abraham-Louis Breguet (1747-1823), born in Neuchâtel, who trained in Versailles and who settled permanently in Paris after a lengthy stay in London. He is regarded by some as the greatest watchmaker of all time. He invented or developed a number of important additions to watch design, including the tourbillon (a device which enables the gear train to function smoothly irrespective of gravity) and the self-winding watch (developing an idea commonly attributed to another Swiss, Abraham-Louis Perrelet (1729-1826)). The Swiss (or rather, Genevans,) not only kept at the forefront of innovation, they were also good at commerce and this ability was backed by their banking system. From the beginning, production was export-orientated. A class of merchants developed who specialised in the watch trade, and who could report back on the tastes of different countries. Initially the watchmakers copied – indeed, pirated - French and English designs, producing them more cheaply, thanks to more efficient production methods, and marketing them successfully. As the industry took hold, they started creating their own designs. The component parts were made in people's homes or in small workshops in villages around Geneva, under the system known as homeworking. (See: Watch Valley) They were then returned to the craftsmen of Geneva for the finishing touches. For many years watches were not the relatively austere items that we know today. They were not worn on the wrist (wristwatches only became popular in the 20th century), but on chains, in the pocket, looped through a belt etc. They were as much articles of jewelry as practical timekeepers. One of the Genevan strengths was in decoration, and this made their wares all the more attractive. The technique of applying a layer of transparent enamel over a painting was invented in the city in 1760, and used to enhance clocks and watches. Another skill which was exploited in the clock and watch industry was the making of automata, or machines that imitated living creatures. In the simplest form this could simply be a figure whose moving arms pointed to the time, but more complex designs included whole animated scenes. Later, sound was added to movement: at first chiming bells, and later tunes, on the principle of the musical box. Starting in the 17th century, and growing in importance in the 18th and 19th centuries, Asia was an important market for Swiss clocks and watches. The Genevans started off in Constantinople (where Rousseau's father, Isaac, became official timer in charge of the clocks in the Topkapi Palace), and later expanded to China, where their wares became popular among the Qing dynasty aristocracy in the middle of the 18th century. Exports to China reached a peak in the decade 1810-20, to virtually collapse with the outbreak of the Opium War in 1839. Watches were adapted to meet the needs and tastes of their customers. 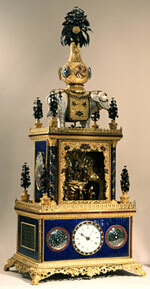 Watches with automata were particularly appreciated in Turkey and China, and many of them were given a specifically local touch for this market. For the Chinese market clocks were made in pairs, probably because it was a Chinese custom to make gifts of two of any item. English merchants were also well aware of the practice, but the Genevans took it one step further, reversing the decoration on their pieces so that they mirrored each other. In the 19th century they made "Rajah watches" for India, creating enamel portraits based on photographs sent to them for this purpose. Not all clockmakers had happy experiences. Rudolf Stadler of Zurich, who worked for the King of Persia in the middle of the 17th century, was slandered by a local business rival and executed – something the king immediately regretted, especially since his watch soon stopped working and no-one could repair it. Stadler's tomb can still be seen in the Armenian cemetery in Isfahan. A major breakthrough in Swiss watch production came in the early 1840s when Georges-Auguste Leschot (1800-84), the technical director of the firm of Vacheron Constantin, invented a series of machine tools able to make watch components – something previously thought impossible. The new watches could be produced in much greater numbers and were far more accurate and much cheaper, although Leschot still insisted that every part should be worked on by hand. Swiss watchmaking went from strength to strength during the 19th century. By the middle of the century they had overtaken the British both in manufacturing and sales and were the world's major producer. The millionometre, designed by Antoine LeCoultre in 1844, was the first instrument capable of measuring a micron, one millionth of a meter. This converted watchmaking to the metric system, and became a standard measure. The first serious rivals appeared on the scene in the middle of the 19th century, when American watchmakers started mass production of watch components that were so precise as to be fully interchangeable. The impact was dramatic. Swiss watch exports to the US fell by nearly 75% in the space of about 10 years. This was a serious blow to the Swiss industry which led them too to embark on the precision machining of parts. In the early 20th century they also started making their watches more attractive by adding extras, such as calendars and a stop watch facility. Rolex made the first water resistant watch in the 1920s. The 20th century The major revolution of the 20th century initially passed Switzerland by. Although the first quartz watch was actually developed at the Electronic Horological Centre (Centre Electronique Horloger, CEH) in Neuchâtel in 1967, Swiss companies failed to capitalise on the new technology. They left it to others, in particular in Japan and the US, to improve on the discovery. 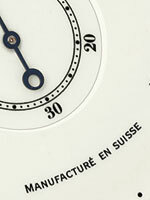 The Swiss put most of their research and development funds into improving mechanical watches. It was an error of judgement which almost destroyed the industry in the mid 1970s as the bottom fell out of the market for traditional watches. Switzerland was no longer a major player as far as watches were concerned. But the Swiss fought back in an unexpected way. They called in a business consultant who introduced a revolution of his own: the watch as fashion statement. The cheap electronic Swatch watch has sold in its millions, and put the country back at the top of the world's exporters in 1995. (See: Swatch) The success of the Swatch is credited with turning around the fortunes of the Swiss watch industry as a whole. It boosted confidence in Swiss watch making and showed the Swiss how to sell their products.